Dotty Detective The Birthday Surprise is the fifth Dotty Detective book and is published today. We have a huge Dotty Detective fan in our house, as soon as she’d finished reading this book she asked when the next one will be published! Dotty records her adventures and thoughts in her diary, which is the perfect format for children who are starting to read independently, and we love her chatty style which gives an intimacy to the way that she shares her experiences. The diary entries are interspersed with illustrations including maps, photos and doodles, the layout of every page is different. This humorous, informal style perfectly complements the chattiness of the text, it is a style which children will easily identify with. The Story: Dotty discovers that her teacher, Mr. Dickens (Mr D), has a birthday in the same week as hers. Together with her classmates she makes him a very special birthday present but disaster strikes when it goes missing. Can Dotty and her friends solve the mystery of the missing present before Mr D’s birthday? The birthday present mystery is intertwined with a class project on Ancient Egypt and the impact that the arrival of a new classmate, Bradley, has on Dotty’s friendship with her best friend Beans. A competitive element is added to solving the mystery. Dotty teams up with the girls and Beans works with the boys to solve clues in order to find the present and who the culprit could be, the race is on to find answers before Mr D celebrates his birthday on Ancient Egypt day. There’s intrigue at home too, Mum is making secret plans for Dotty’s birthday party which also involve Dotty’s dog, McClusky. The story moves at a page turning pace as we share Dotty’s excitement about the two birthdays, her confusion over her friendship with Beans and her horror when Mr D’s birthday present goes missing. Clever uses of Egyptian artefacts are involved in the birthday present mystery, we particularly love the secret letters written using hieroglyphics, and their inclusion also stimulated questions and discussions about Ancient Egypt. We now want to build a pyramid like Dotty! So much of the humour comes from Clara’s illustrations. We laughed at the picture of McClusky at bathtime and found the contents of Frankie’s tray funny. Dotty’s birthday cake is absolutely awesome but our favourite picture is of Dotty’s twin siblings, Alf and Maisy, pretending to be superheroes! 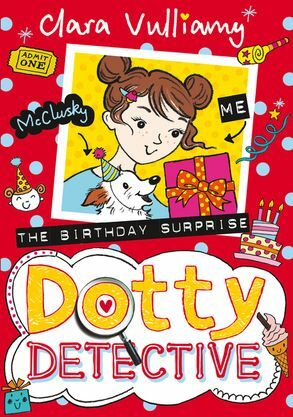 Dotty Detective The Birthday Surprise captures all the excitement and anticipation of a birthday as well as the fundamental elements of friendship, family and the little everyday incidences that are so important and familiar to a child. It would make a great birthday present! All of the Dotty Detective books are listed on Clara’s blog. This sounds like such a winner! Hieroglyphs in messages–that’s brilliant! I’m dying to read this one. Oh, this sounds like such a lovely read. The educational twist is very clever too. Love the secret letters in hieroglyphics, how fun! Great review 🙂 If your little one loves these books you should definitely check out the Juliet Nearly A Vet books by Rebecca Johnson! They are another lovely educational read. This sounds like a really exciting story! I’m going to go and order it for Chloe!